The front of the Medal represents Mary Most Holy standing on the earth, Her foot crushing the head of the serpent, and Her hands outstretched in a gesture of motherly compassion to all who ask Her assistance. The prayer reflects Her title as the Immaculate Conception defined infallibly twenty-four years later on Dec. 8, 1854 by Venerable Pope Pius IX in his encyclical Ineffabilis Deus. The rays of light from Her hands symbolize the graces She is eager to bestow on those who wear Her Medal and pray to Her. Within two years, having been given the approval of the Archbishop of Paris, the first medals were made and distributed in France. Immediately blessings began to shower down on those who wore it and it quickly became known as the ‘Miraculous Medal’. In just a few years, millions were being distributed. No sacramental of the Church had made such an impact on the Church since the Rosary had routed the Albigensians and the Turks. 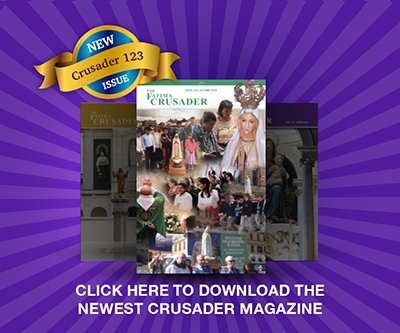 It works miracles literally and seems to specialize in the impossible, the conversion of the hardened sinner, the care of the hopelessly ill. With the exception of the Holy Cross, no other Christian symbol was ever so widely multiplied, or was ever the instrument of so many marvelous results. Some of the graces that St. Catherine suggested that people should ask of God included: The grace of a cheerful disposition, the grace to recognize and accept the trials of everyday life as blessings from God; to be contented with one’s state in life; to understand and appreciate the Holy Sacrifice of the Mass and especially ‘to love God as much as Our Lady wants me to’. St. Catherine Labouré, who stated that she saw Mary “in flesh and bone” and had the privilege of kneeling at Her knee and resting her hands in Our Lady´s lap, a favor not granted to any other seer, was born during the ringing of the Angelus on May 2, 1806. Her earthly mother died when she was only nine years old. 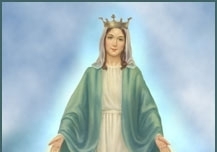 She was witnessed to have embraced a statue of the Mother of God and saying, “Now you will be my Mother!” and fostered a lifelong desire to see Our Lady. It was the constant petition of her prayers and she was serenely confident it would be realized. St. Vincent de Paul visited her in a dream when she was eighteen and she entered the order he had established on January 22, 1830 at the age of twenty-three. St. Catherine considered the apparitions in proper perspective, not as a personal favor to herself (though in a sense they were) but rather as a general boon to mankind. She only considered herself as “an instrument” and she made her confessor promise to keep her identity secret, a secret kept even from her fellow religious for forty years. 1958 Farrar, Straus & Cudahy, Inc.
LET US PRAY. 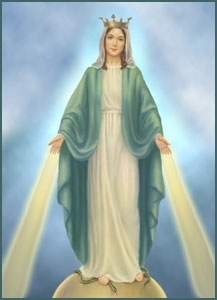 — Almighty and merciful God, who through numerous appearances of the Immaculate Virgin Mary on the earth, has deigned to work wonders continually for the salvation of souls, graciously bless † this symbolic Medal; that those who meditate on it piously and wear it devoutly may both experience Her protection and obtain Your mercy. Through Christ Our Lord. Amen. Receive this holy Medal, wear it faithfully and treat it with due veneration; so that the most pious and Immaculate Queen of Heaven may protect and defend thee, and, ever renewing the wonders of Her goodness, may mercifully obtain for thee whatever thou humbly ask of God: that thou may rest happily in Her maternal embrace throughout life and in death. Amen. LET US PRAY. — O Lord Jesus Christ, who has vouchsafed to glorify by numberless miracles the Blessed Virgin Mary, Immaculate from the first moment of Her conception, grant that all who devoutly implore Her protection on earth, may eternally enjoy Thy presence in Heaven. Who, with the Father and Holy Ghost, lives and reigns, God, for ever and ever. Amen. Imprimatur: † John J Krol, D.D.